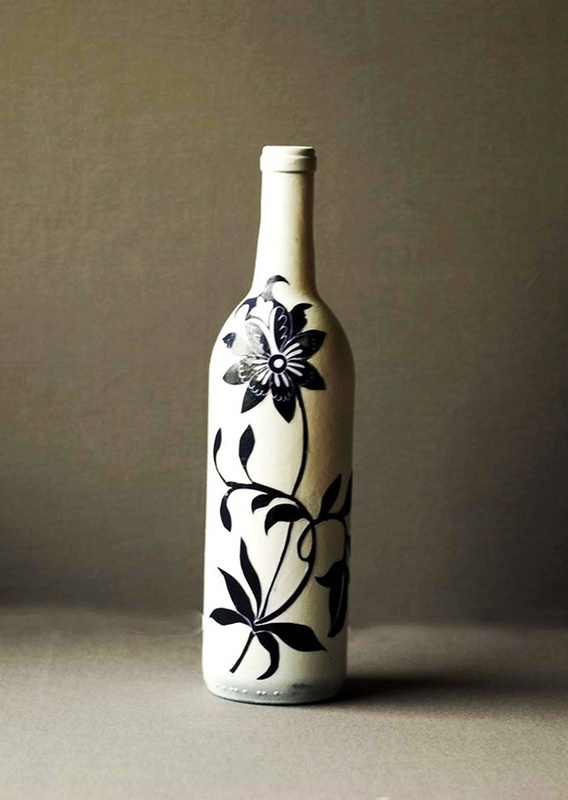 Wine bottles have always been so very elegant that we have never wanted to throw them away, right? 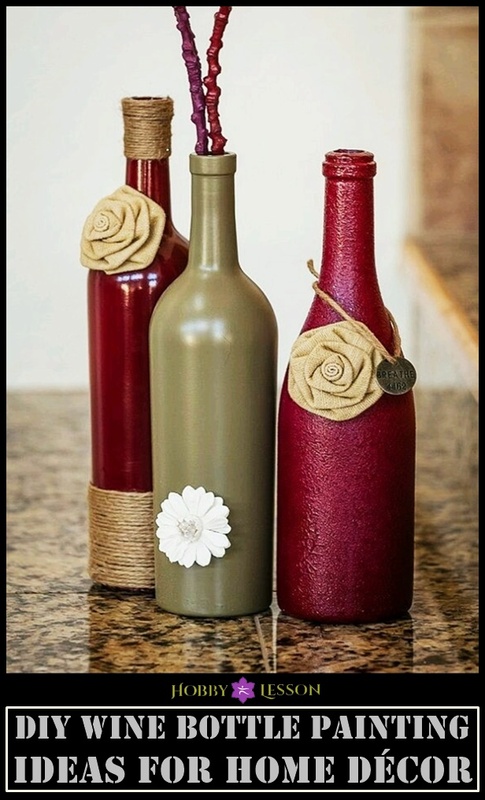 Truly so, the wine bottles can be made into just so many DIY Wine Bottle Painting Ideas for Home Décor, on the creative end; that you just do not need to throw them away! A few of them will give you Christmas vibes, while the other will give you ways to mark out of the Monday blues! 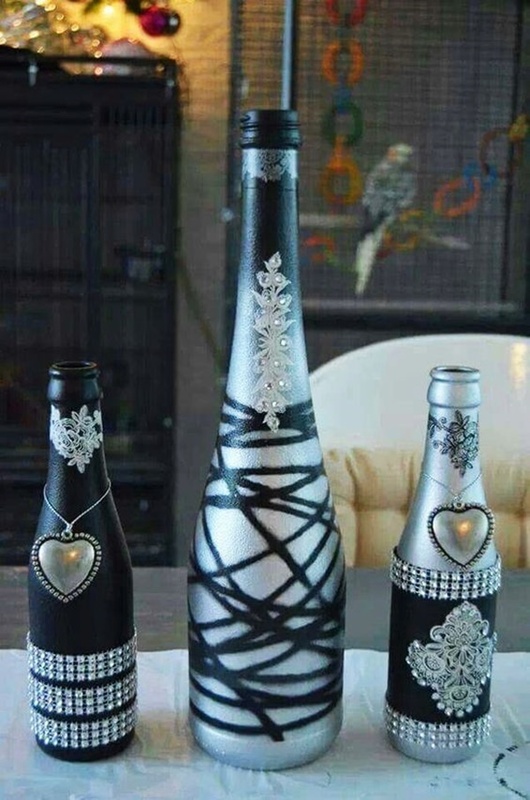 Be it for the room décor, or for your hallways; and even for your balconies – you can use these wine bottles, converted into something utterly creative; as your mark of art and addiction! 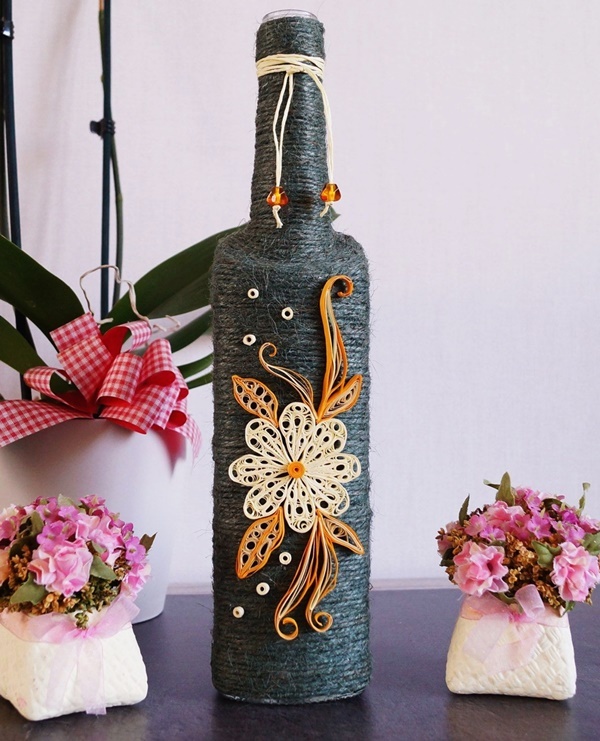 If you are thinking what you can do with the wine cork, Don’t worry you can try these easy wine cork craft ideas to make proper use of the full bottle. 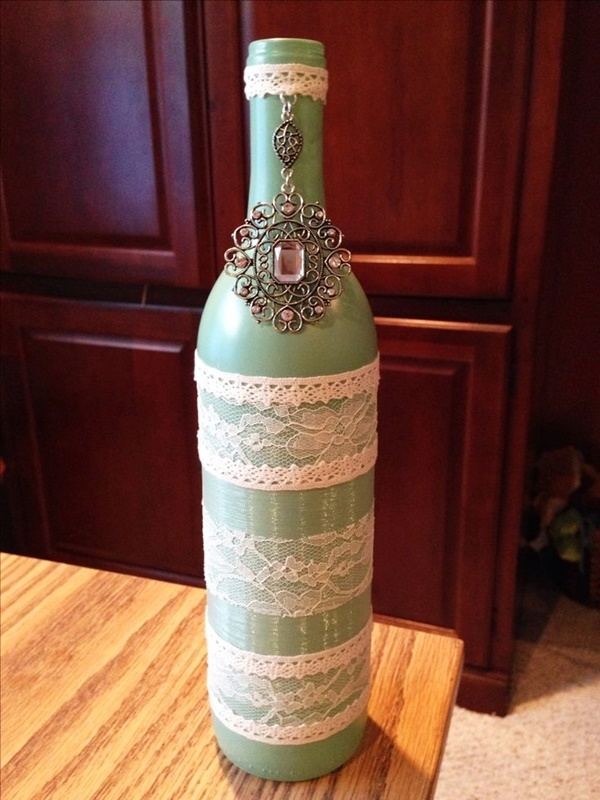 Laces do wonder on almost everything! Ahem, where are your thoughts wandering? 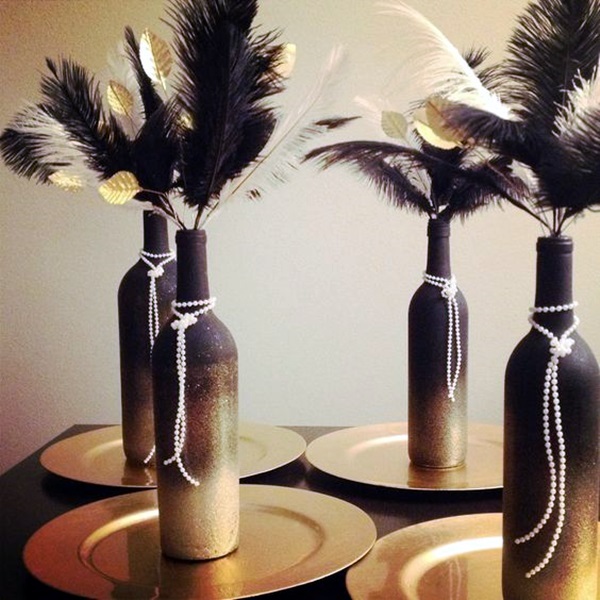 We are talking about the décor! 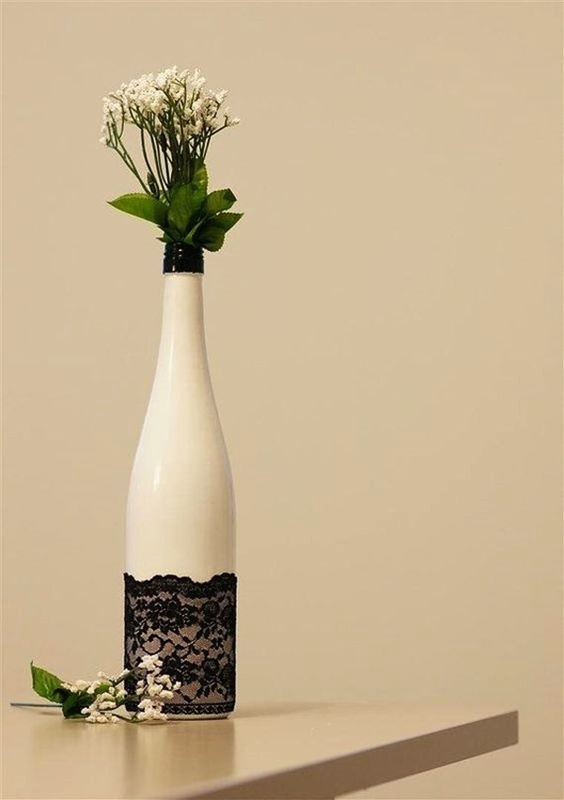 You can have the bottom of the wine bottles covered up with beautiful laces and have it used as a showpiece on the center table. 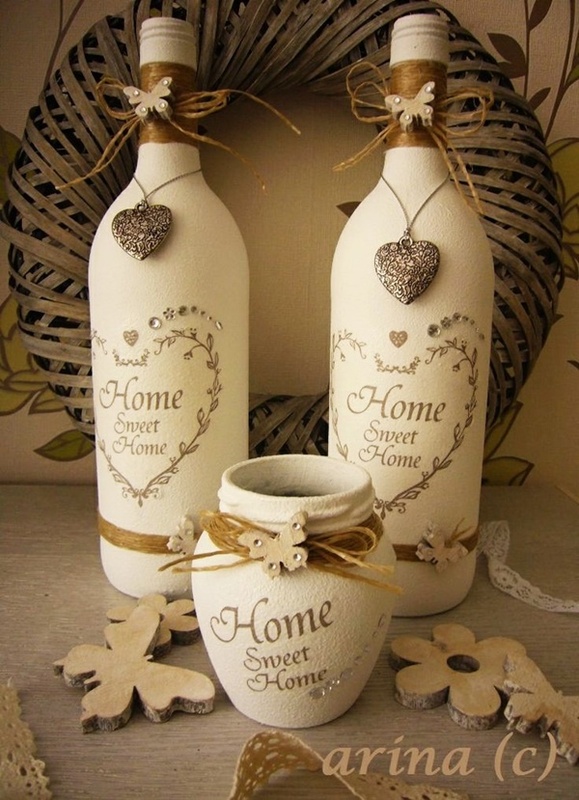 Be it for your personal home décor or for marriage decoration; you can always use these. 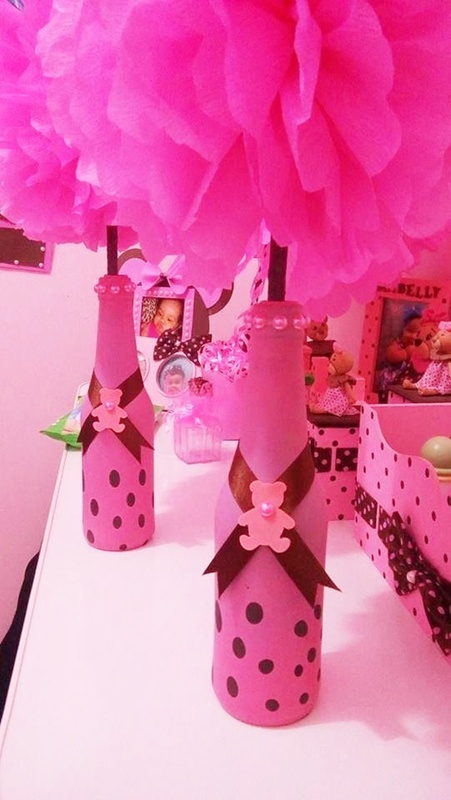 Also, stuff up the bottles with artificial flowers. 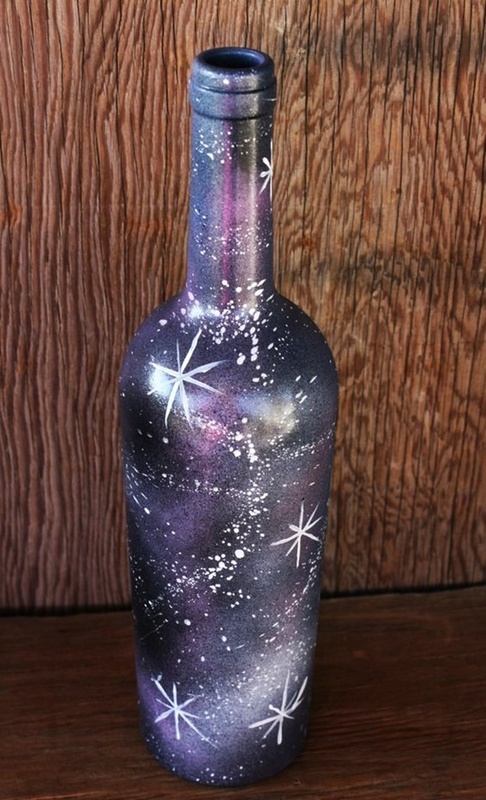 How About The Wonderful Themed Bottles? 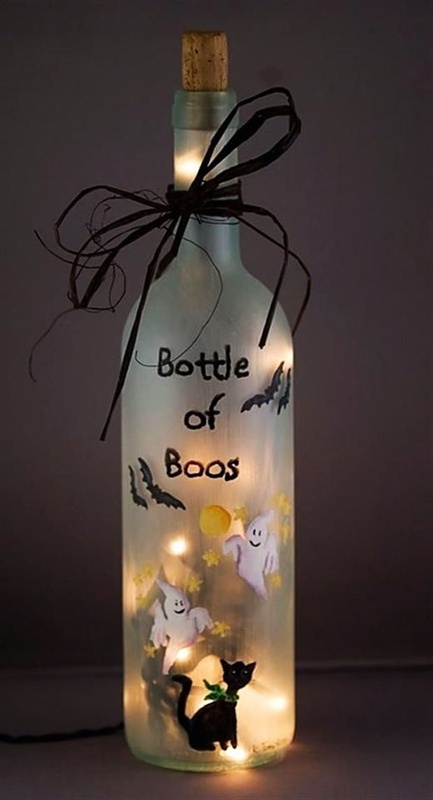 Halloween, kitty parties and a lot of other festivals and parties look for themed decoration about the rooms. 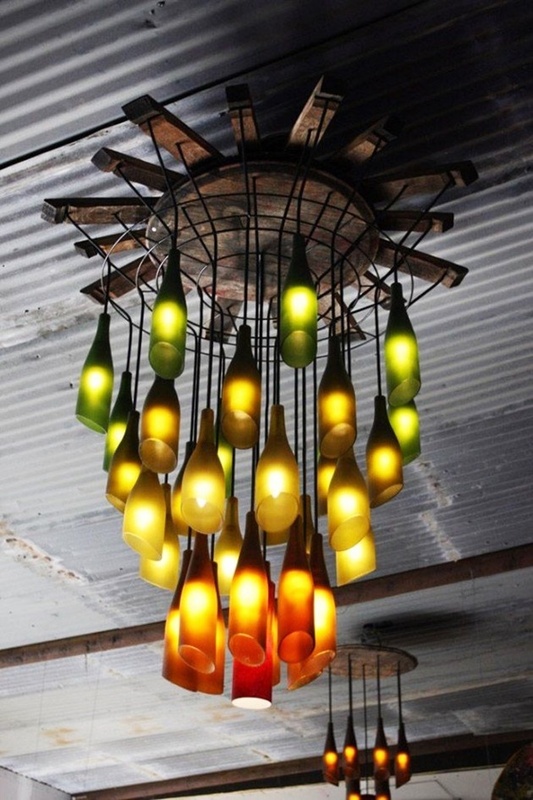 Using the wine bottles will definitely give a vintage as well as a very posh look to your décor. 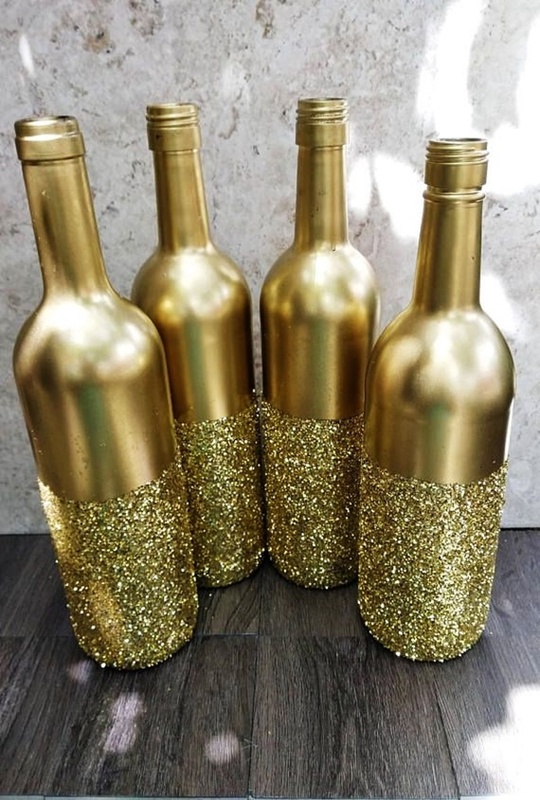 Use craft paper, scissors, and basic stationery to draw whatever you want the theme to be on the craft paper, and stick it on the body of the bottle; decorate the neck with glitter. 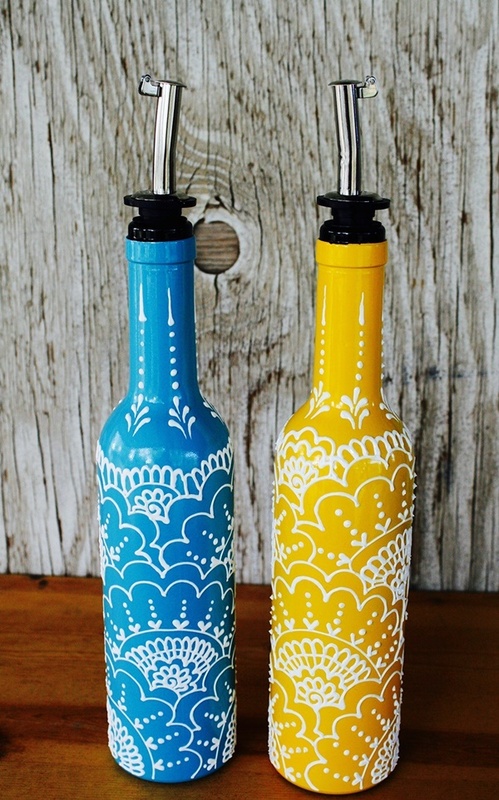 Here Are Our Sooooo Under-Rated Stencil Bottles! No, who told you stencils are only for your geography homework? 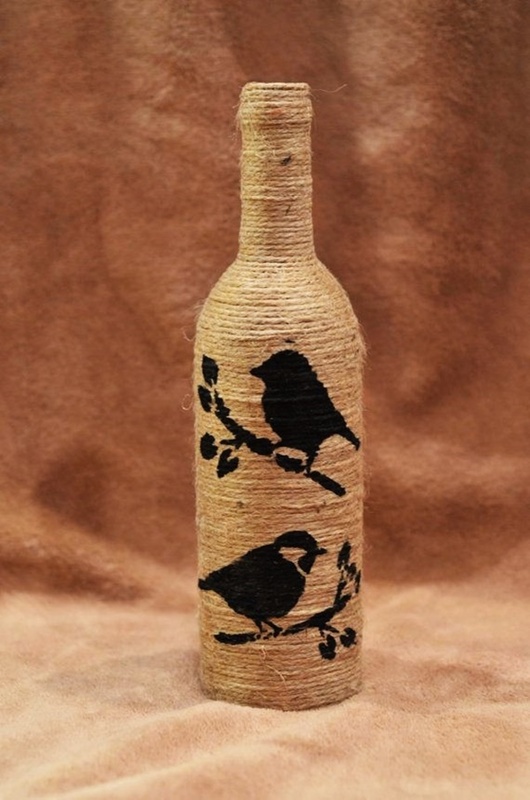 You can use stencils on the bottles; using a craft paper on the bottle. 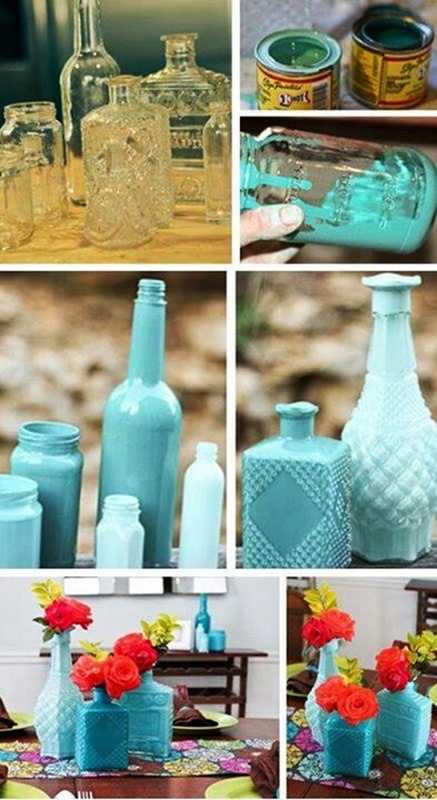 We have a brilliant idea- Stick the stencil on the glass bottle and use glass paints on it. When you’ll remove the stencil, you’ll have what you need! 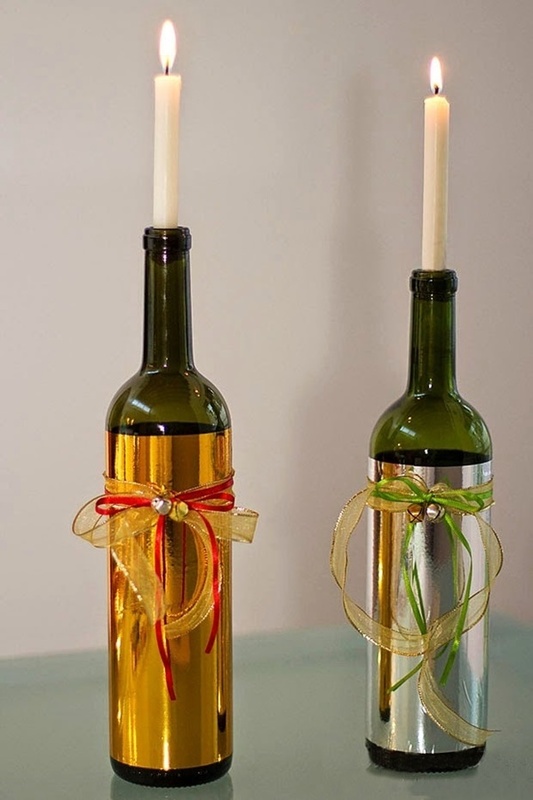 Honestly, the dates are so very important; and if they are at your place or on the terrace- the decoration resides on your side. 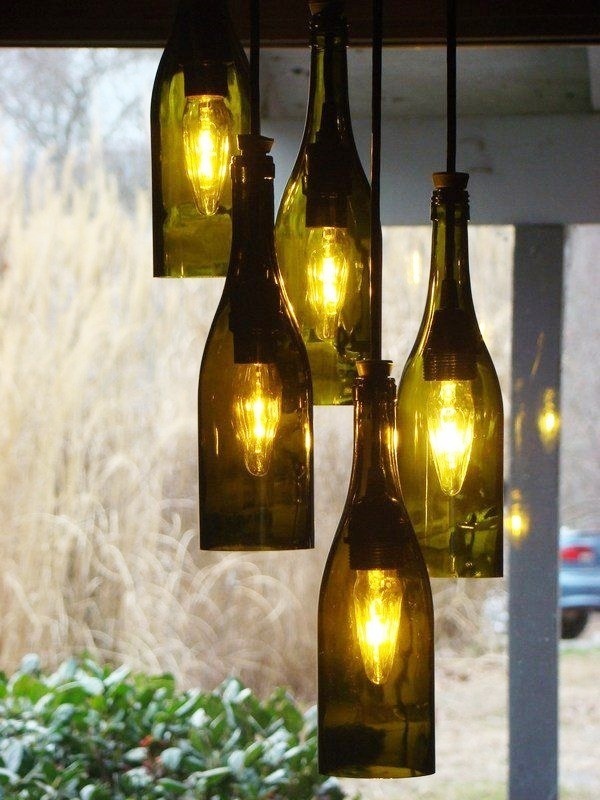 The bottle lights are a wonderful thing that you can try out at. 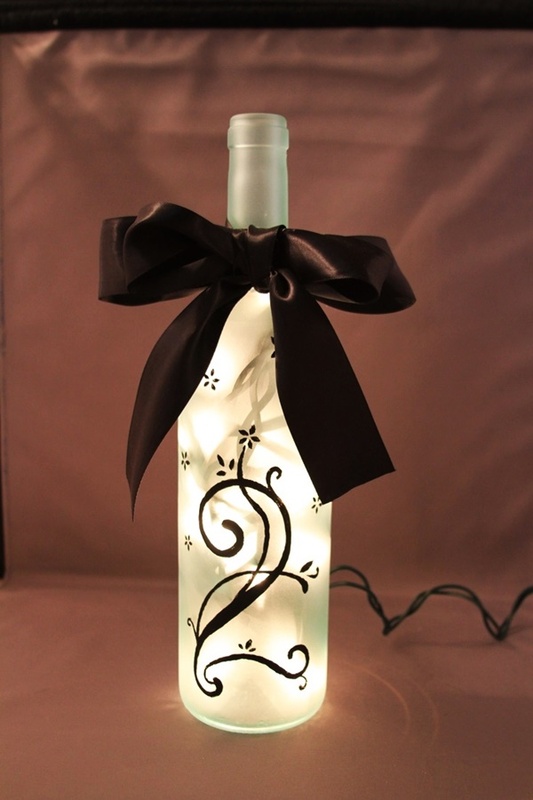 Use the black sheet or craft paper to cut out of whatever shape you wish like. 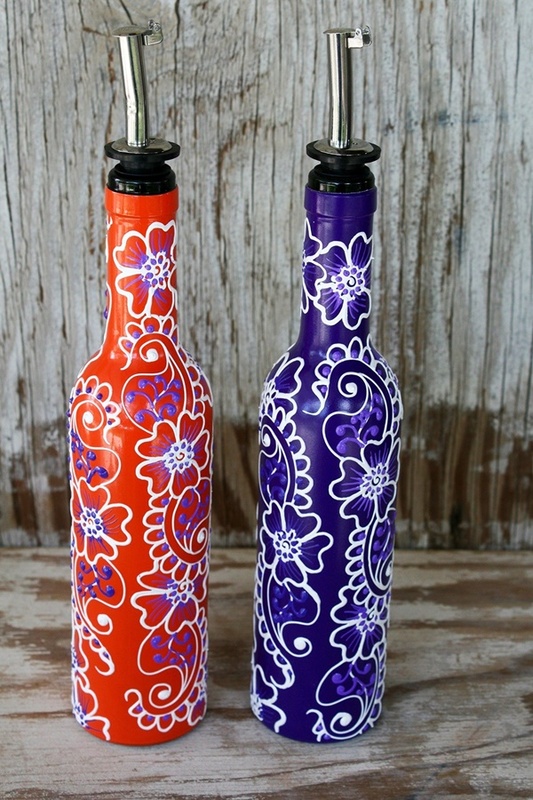 Paste them on the wine bottles. 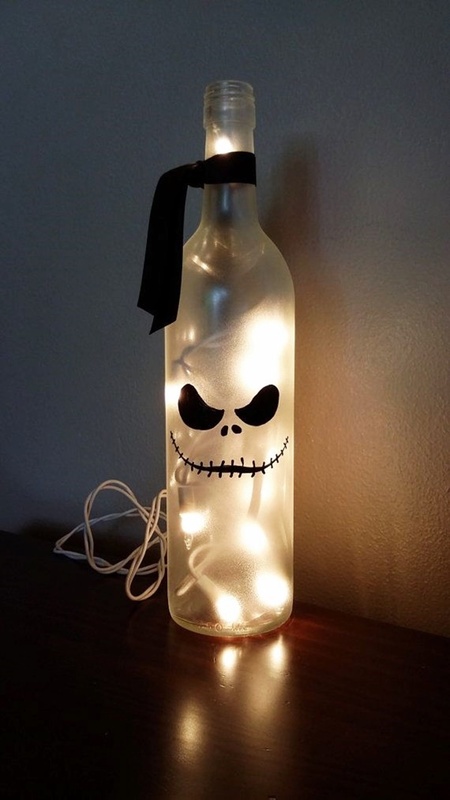 Use LEDs or normal serial bulbs inside of the bottle. 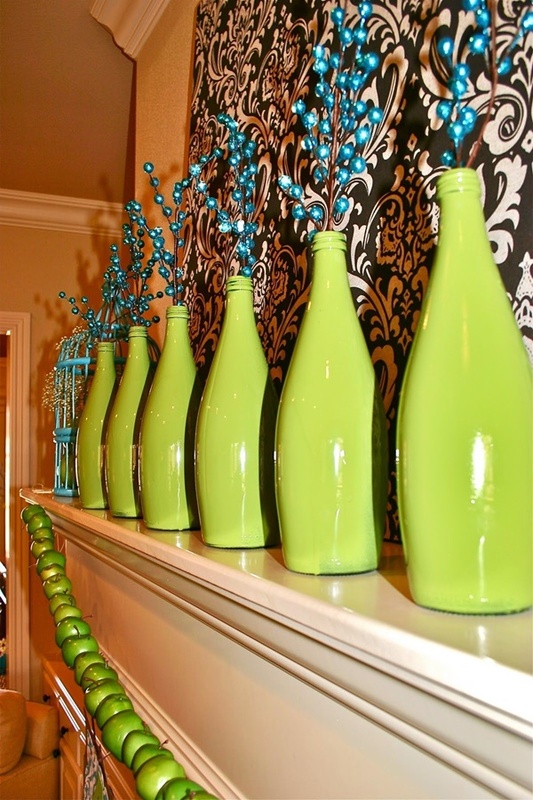 Oh, How Much We Love Balloon Bottle Décor? 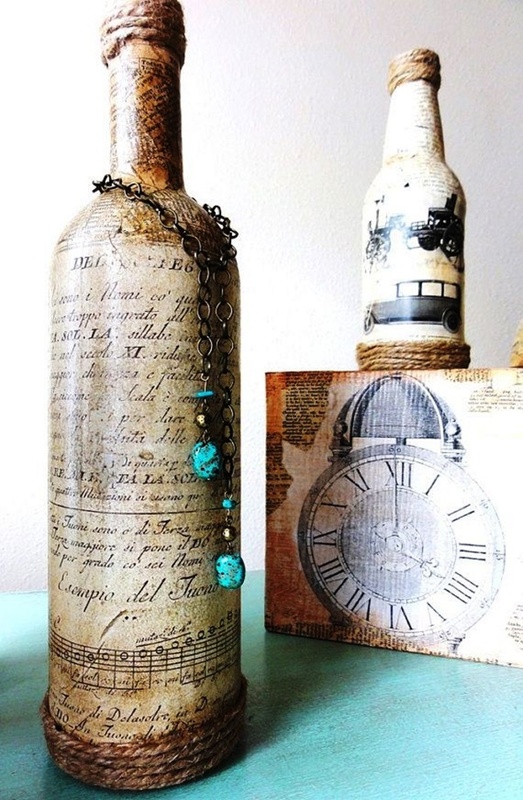 We bet you would never have thought of these cool Wine Bottle Decoration Ideas, right? But don’t you worry, you have our back! Get hold of balloons other than the mundane solid colors. 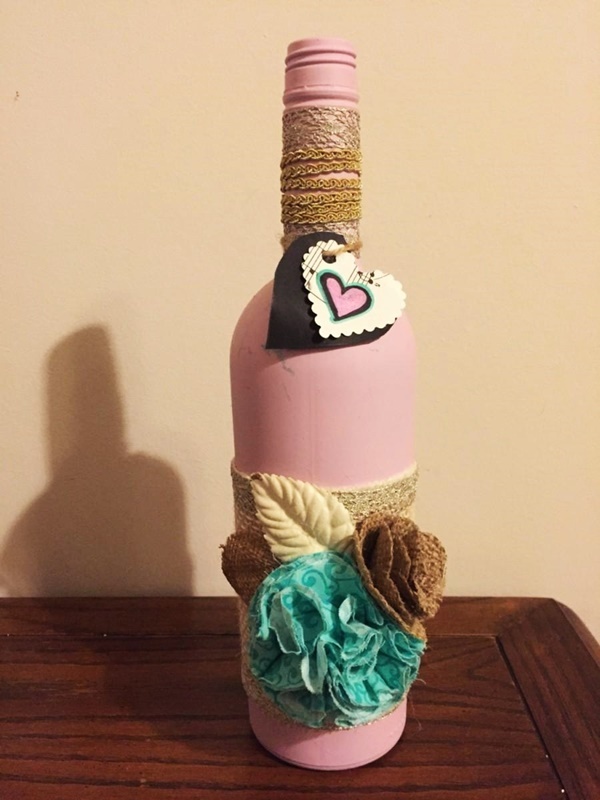 Have the balloons cover up the entire bottle, including the neck. 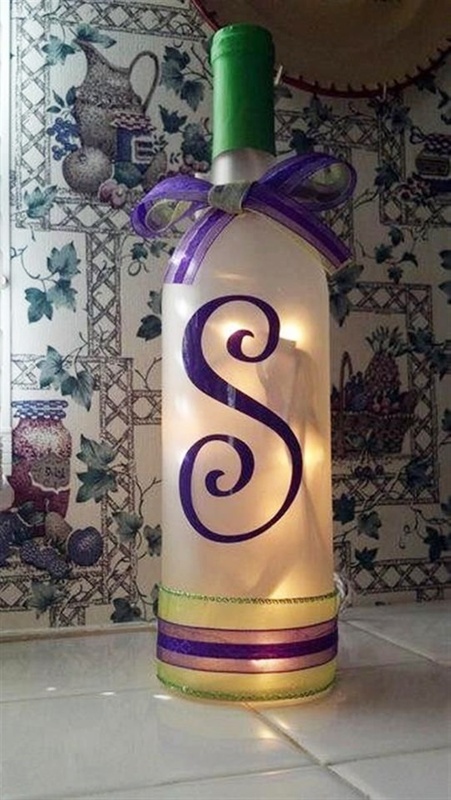 And tie the end of the balloon with a satin or a shimmery ribbon! Lo, behold! 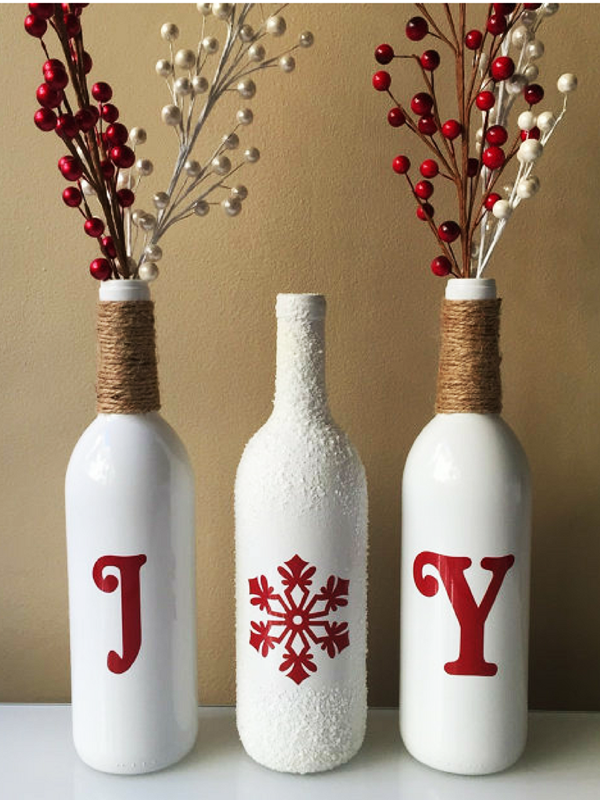 You have your wonderful table décor ready with you. 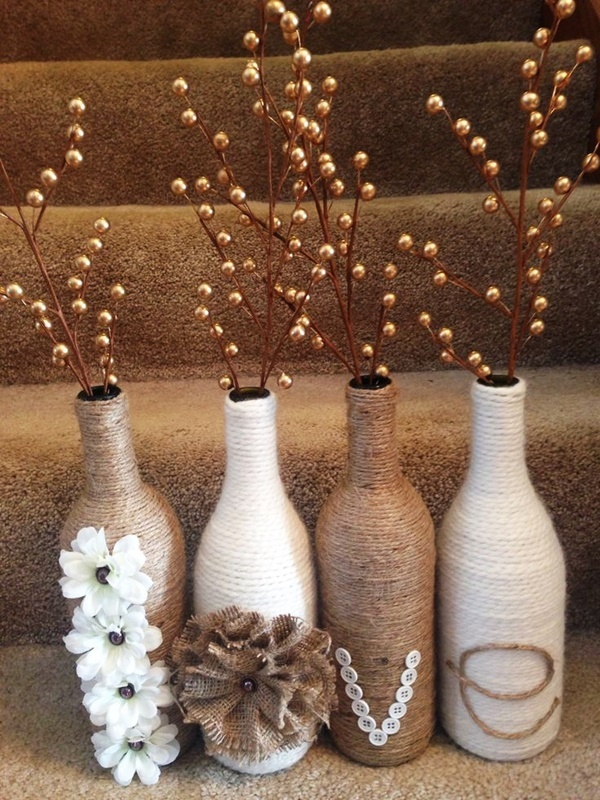 Do you have that thing for jute and jute products? 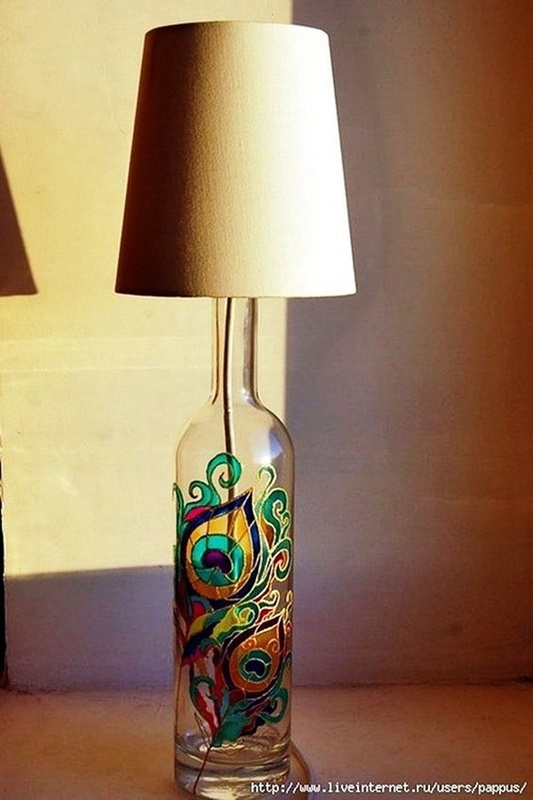 Then you should go with this idea. 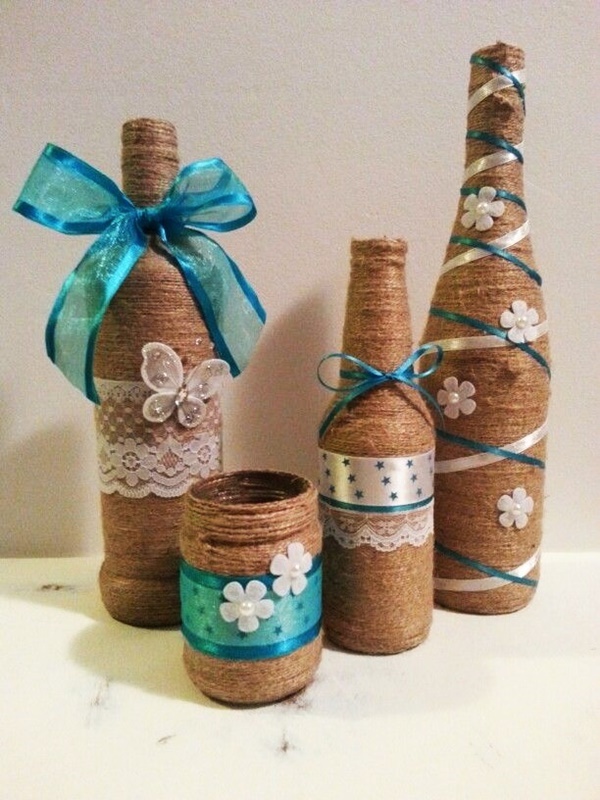 Get hold of jute threads and start wrapping the entire bottle with it. 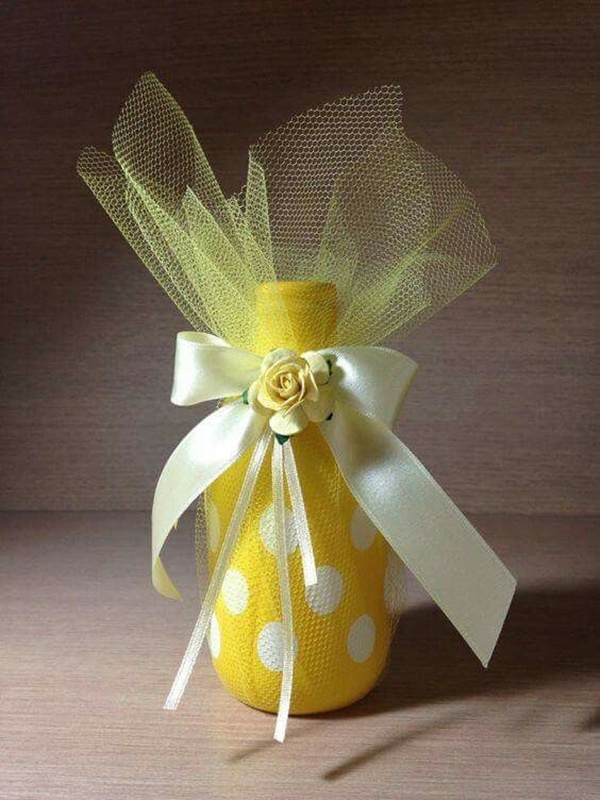 You can also use some add-ons like readymade flowers made of satin or something like that, and have it glued to the portion you want to be the front side. 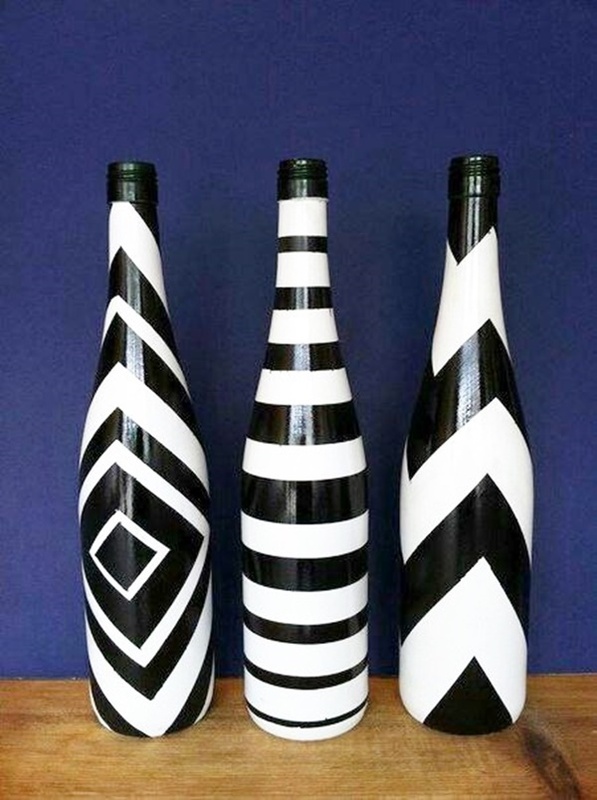 That’s it; you have the most unconventional of the wine bottles ready at your home. All That Glitters Is Definitely Really Good! 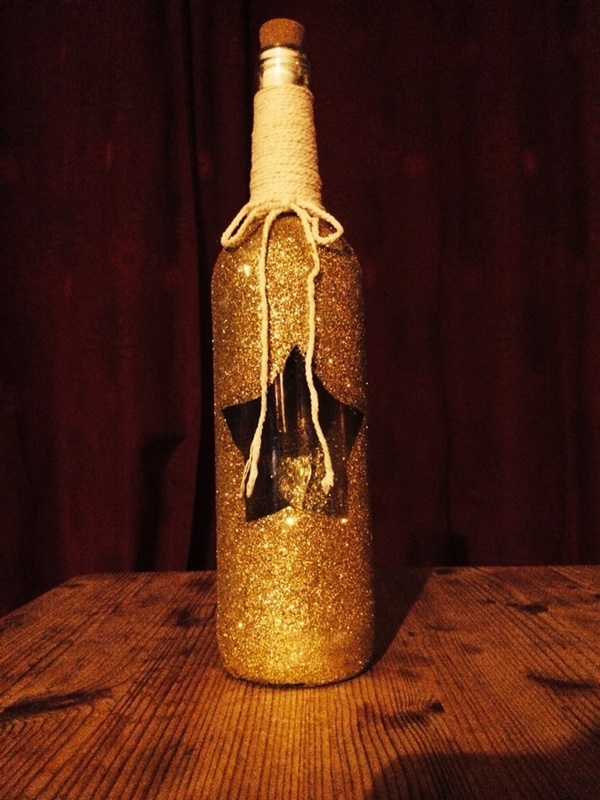 While you are at it, go to some decoration or stationery store and ask them for a glittery and shimmery tape. 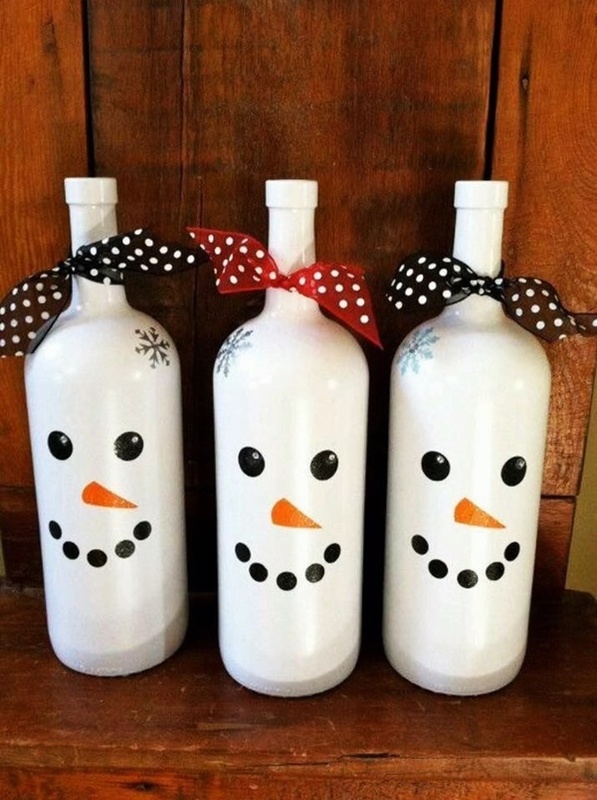 They’ll give you the one that’ll be easy to stick on the wine bottles and will definitely not cease to amaze you and your superb skills! Stick the entire of the bottle with the tap and you are done! 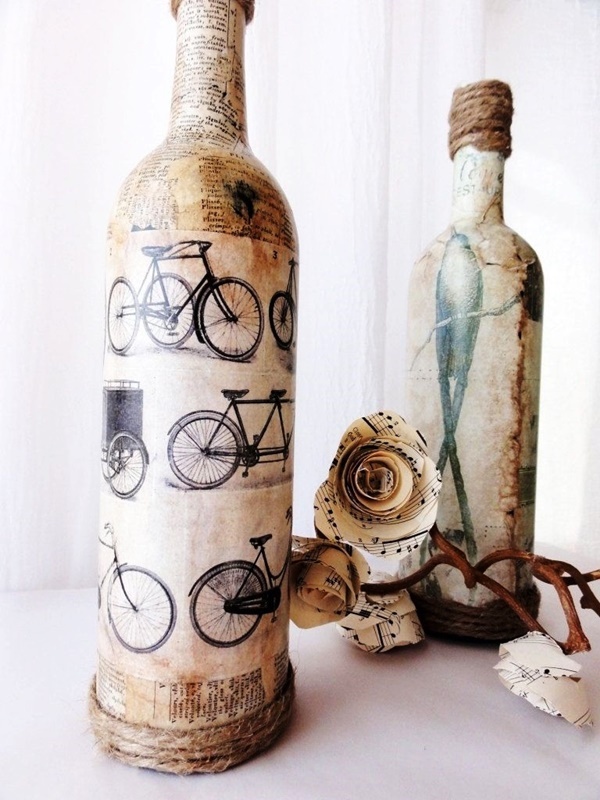 The Wine Bottles Gone Vintage! Of course, this will need a little of your efforts. All you’re going to do is find a store that will have the printed sheets of paper. Look for the ones that will have maps or vintage items printed all over; and use the same. 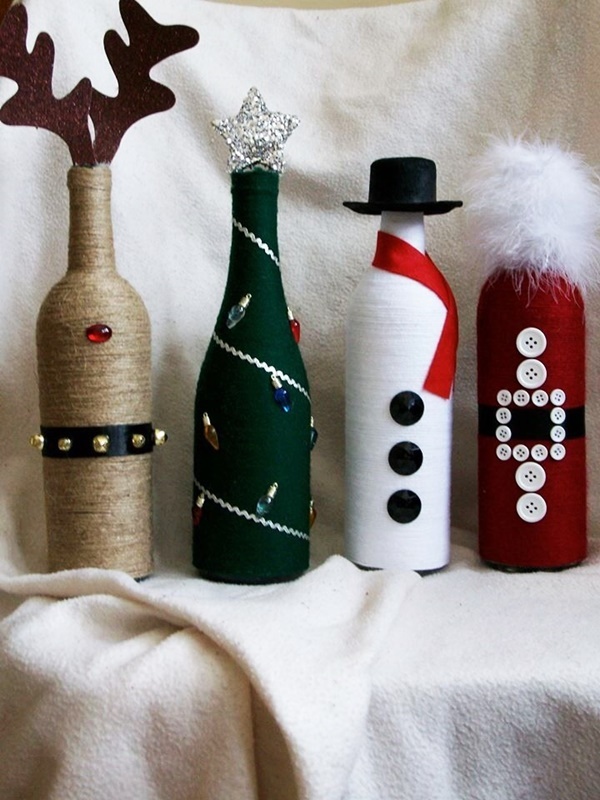 All Set For The Christmas Bottles? Christmas times really call out for a lot of people visiting your place, or maybe just a small party that you’ve organized. 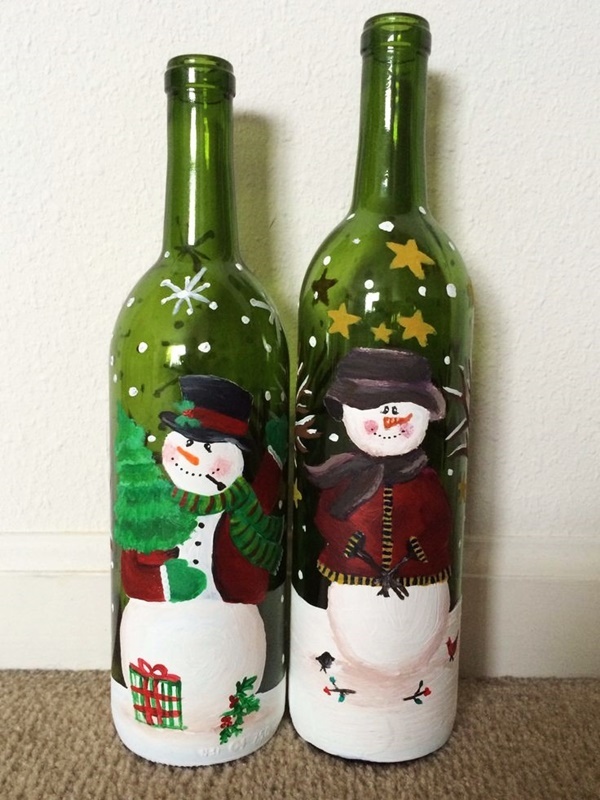 Whatever be the case, all you’ll need to do is decorate the bottle with something that signifies Christmas. Maybe use a small red colored cloth that’ll be symbolizing Santa. 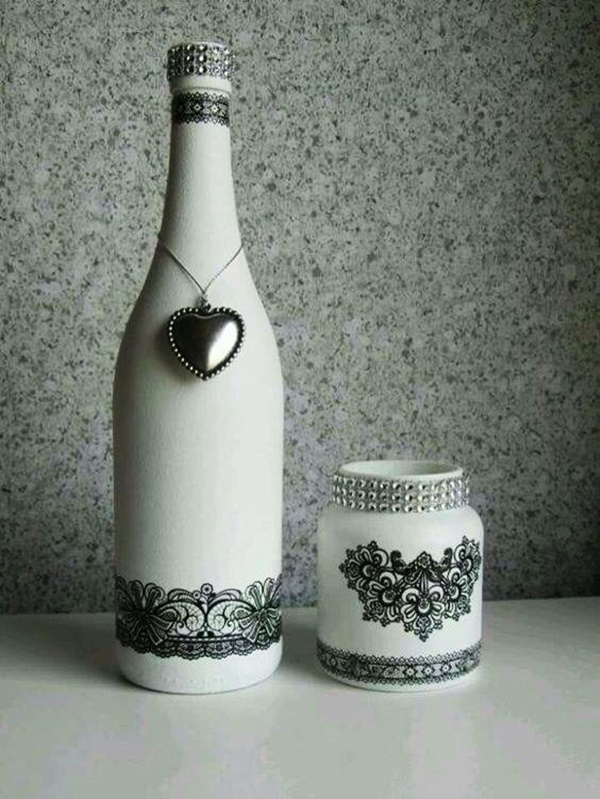 This Is For The Ones Who Love Art: Ever Thought Of Intricate Designs? 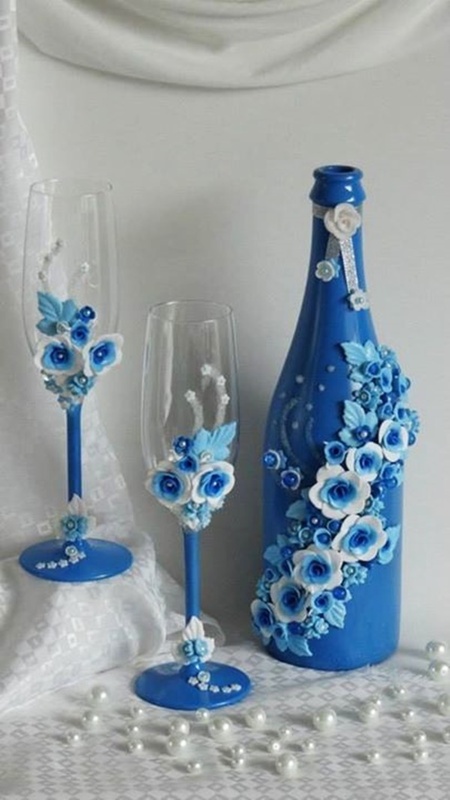 Use beads for the same and have the entire bottle look so very elegant, and in the truest form of whatever you might have thought of. The designer shops have them all. The way you’re going to choose all of these designs will give out the people the vibe of your perceptions of things. That’s what the decors are about, right? 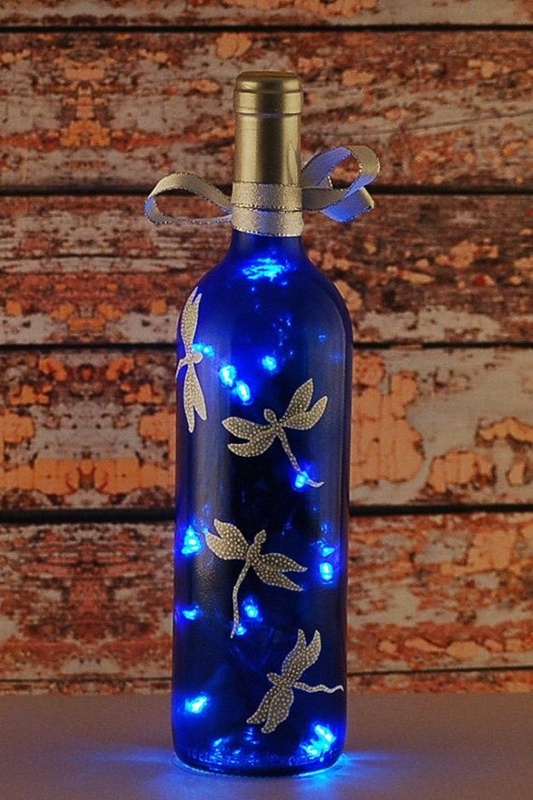 These are the ideas we brought in the most unique ways and the most elegant DIY Wine Bottle Painting Ideas for Home Décor, of course. Holidays are here, go try them out!